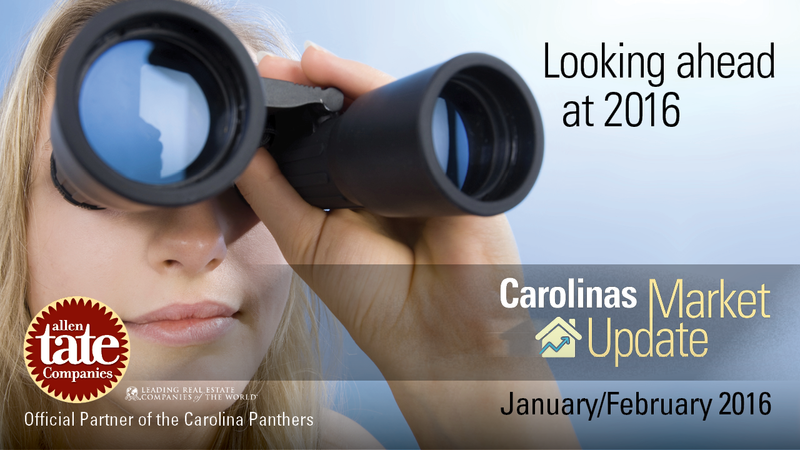 The Carolinas continued on a quest for real estate normalcy in 2015, and both buyers and sellers benefitted. Allen Tate Company saw its second-best year in history, with double-digit increases in both closed sales units and closed sales volume, as buyers finally decided to make some overdue moves. Sellers who entered the market saw an average appreciation of 6-7 percent, mostly because of lack of inventory due to Baby Boomers staying put longer. In 2016, the Carolinas are well-positioned for the steady, sustainable growth that makes for a healthy real estate economy. In the January-February edition of Carolinas Market Update, a bi-monthly real estate video series produced by the Allen Tate Companies, President and CEO Pat Riley takes a look at what to expect for 2016. “We’ll see more listings and more new construction. We’ll also see interest rates creeping up, to about 2 points higher than the historic lows of just a few years ago, possibly reaching 5.5 percent or higher by year-end,” said Riley. Homeowners who have been rebuilding sufficient equity to allow them to sell will finally be ready to make their move. But those who desire new construction will pay more, due to higher land, labor and materials costs. Rising interest rates will move buyers who have been hesitating “off the fence” but may become a consideration for homeowners who want to move but currently have a rate below 4 percent.